Bought this for my small 5x7 paintings. The overhang is much wider than other frames and covers too much of the painting. There are flaws - one has a spot down the front where the wood was scratched and painted over giving it a bubbled look - and both of them have dulling of the finish where the boards come together - looks like glue was wiped away but not completely. I will not buy these again. Had to use them as I was in a pinch - my bad. Hello Mary. Thank you for your feedback. We regret that the frame arrived with flaws. We also apologize that you were not pleased with the finish on the frame. Our goal is to make sure you are completely satisfied with your order. If you still have access to the frame, could you please provide us with a photo of the flaws you have described? The photos will help us determine how this service break down occurred. We would like to send you a free replacement and see how we can make this right. Please email us at customercare@pictureframes.com. I am happy to give you a call so we can discuss a solution. Please let us know what works best for you. We can be reached directly at 1-800-332-8884. We appreciate your business. Have a great day. Second time I have ordered multiples of this frame. The clean lines and simplicity lets the art shine. The quality is always good and the product comes well packaged. I would recommend this frame. 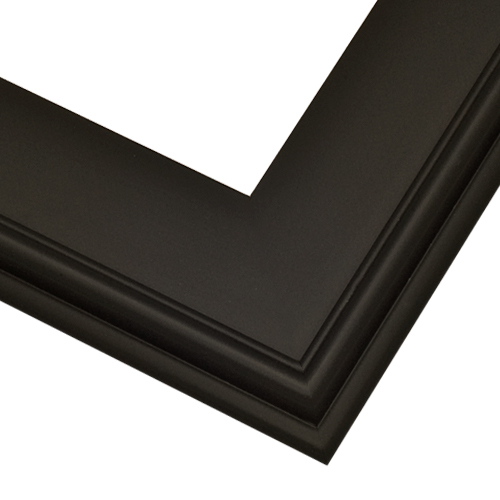 I have used pictureframes.com for many years, and have found their simple black satin frames to be a great value and design. However, a recent order was poorly joined on the corners- I could see actually daylight through the join. It was not sanded, and totally uneven. I didn't have enough time to the return them and have everything remade because of a gallery deadline-- IF I order form them again, I will make sure I have time to return such shoddily made frames. Hello Natalie. We sincerely apologize that the order did not exceed your expectations. Our goal is to provide excellence in our craftsmanship and we are happy to replace any frames that do not meet your expectations. We understand you expect the frames to be in pristine condition to hang in the Gallery. Since time was of essence and you could not return the frames, we are happy to place a company credit on your account. If you still have the frarmes and can provide a photo of the craftsmanship, we will be glad to give you a refund for the order. Please email us at Customercare@pictureframes.com if you are able to provide the photos. Again, we sincerely apologize for the inconvenience. Happy Framing! Frames are very well made, excellent craftsmanship and everything I hoped they would be. I'm very happy with the 16x20 black frame that I recently purchased on-line. It looks exactly how it was pictured and I'm very pleased with the finish of the frames and its overall quality. High quality frame at a convenient price. Very solid. I love the width. It's matte, which I wanted. There were a few little 'marks' on the frame but I managed to rub them out with a fine cloth. Well, once you come to grips with the fact that the framers consistently add 3/16ths of an inch to your measurements and you account for that beforehand, they're pretty nice frames. Perhaps I'll only subtract an 1/8th of an inch next time. Thank you for sharing your artwork Steve. As an industry standard, we add 1/8" 'allowance' to the width and the height. This will ensure that the artwork will fit without being to snug in the frame. When placing future orders, please do not add or subtract from the artwork size. Please give us a call at 1-800-332-8884 if you would like us to enter the order without an allowance. We can back the size down by 1/8". Again, thank you for your business. My PL9 black frame is lovely. 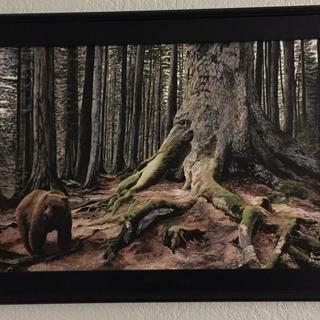 It is just what I needed to show off the print I received as a gift. I am pleased with these frames and will be ordering more in the near future. The wide black front is beautiful for the miniature print I used it to display. This was a great frame for my needs. It was so easy to assemble, with the grooves on the back it was easy for me to screw in the screws I needed. Every thing I needed came with the frame, with the exception of the paper for the back which I don't always do. Nice value, much nicer that our local chain store frames. I would like to support my local framers but at this time I can not afford too. very nice product. 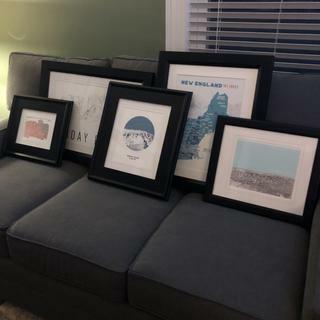 I purchased 5 frames for a new condo. the display will be so cool and priced perfectly. I was worried about expense but these frames are nice quality and priced right! Everything you guys send is perfect. I wouldn't think of using anyone else for all my framing needs. These frames are very sturdy and well made. No imperfections noted. I love the clean lines with just a hint of class. I will continue to order these frames moving forward. I had a client who wanted an understated frame that showed of the artwork well. I was able to order to size and have it delivered before I shipped the finished artwork. The client was pleased, and so was I. One nitpick. The bubblewrap packing around the frame had fine dust on it, and had to rewipe the frame several time to remove it. Since I was reshipping the painting in the same packaging that the frame had come in, I had to take care that no dust got on the surface of the painting. My artwork shines in this elegant plein air frame. I look forward to using this frame style with other photos. This plein air frame makes my portraits shine. I love its minimal elegance. 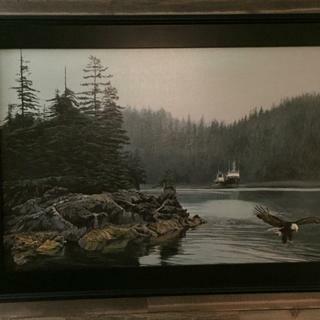 The purchase price with shipping was less than at the frame shop. Beautiful corners, clean finish, perfect size, solid frame! Really nice variety on the easy to use website. This frame is very attractive, well-built . I like the black finish which really sets off my painting. This is a very well built and sturdy frame. It was perfect for this painting, simple and sleek. 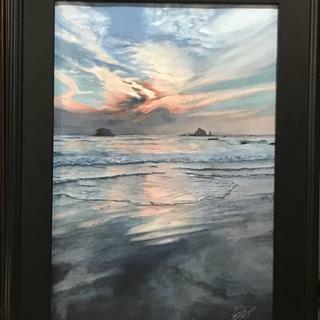 This black frame really brings out the colors in this sunset! I was a bit wary of choosing black, but the paintings I framed looked great. The colors really pop against black, and overall the look is a bit more contemporary, even though the frame is traditional in form (and very sturdy). Love these frames. Especially being available in custom sizes. Work great with my style of oil painting. look really good in the frames. Nice frames. The frames arrived in beautiful condition. I think they really set off these two prints. The frames are each 20” x 30” . Framing was very easy with tools that were shipped with frames. It only took about 5 minutes per frame and then up on the wall they went. Easy, easy, easy. I think when you go basic black you just can’t go wrong. Love this piece. It surrounds a tiny oil 4"x12" and because of its over size, puts focus on the painting of cows in a meadow. Tiny cows too! This was a great picture frame. I was really surprise. It was very very easy to assemble. I will use them for all my picture frame needs. Very nice. Perfectly frames the picture I have in it. The frames were exactly as I expected very nice product very good Packaging very quick service although I did have small chips on my corners when they cut the frame pieces. This is the second order I have made and intend on making another I am framing original artwork by the artist Wyland. Hello Mario. Thank you for letting us know about the chips in the corners of the frame. We are more than happy to send you a replacement frame that will not have chipped corners. Or, we are happy to offer you a company credit if you want to keep the frame. If you don't mind, could you please take the time to email us photos of the chips in the corners of the frame? The photos will help us improve our quality assurance. 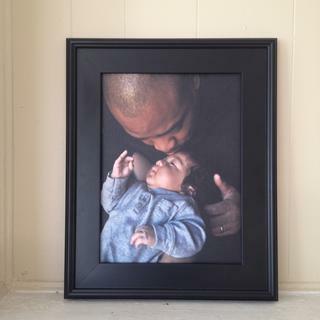 Please email the photos to customercare@pictureframes.com, attention Shea J. Once we have reviewed the photos, we will set up the replacement order. If you have any questions, please let us know. We can be reached at 1-800-332-8884. We apologize for the inconvenience. Have a great day! The frame looks cheap, I think it may be plastic? The frame was sized correctly and once I hung it on wall it looks OK from distance. Hi Marie. Thank you for your review. We regret to hear that this frame did not work out for you. We do offer a 45-day return policy so that you may find a frame that is better suited for you. We also offer samples of all our frame, excluding clearance, so that you can see and feel the frame before purchase. This frame is made of wood. Our customer care team can assist you in making this right and answering any other questions or concerns you may have. They are available Monday-Friday 8am-7pm eastern time and can be reached at 1-800-332-8884. Thank you again! It will not distract from the portrait I'm framing. It straddles the line between contemporary and traditional. The black is a beautiful complement to the painting (a white dog sitting in the shade with blue and gray tones in his fur). I have purchased this product before. Quality construction and sleek, artistic look. Profile is thick but not overwhelming. These add polish and bulk to smaller works with shallow depth. The style suits all mediums and black is the most used frame color. Great site and service. Exactly what I want and need. NEVER have I been disappointed. Simple clean look that does not take away from the art. Perfect for framing my drawings which I mount on board. It's relatively inexpensive way to really make a drawing come alive and work with traditional decor as well as modern. It was simple and will go with a lot of my art work. Plus, the PRICE, PRICE, PRICE!! I use this frame for much of my artwork. Its simplicity enhances the view of the painting and the overall look works in both contemporary and more traditional homes. I seldom use black frames for my paintings but I have one that needs a dark wide unadorned frame made of wood because the painting has very dark background. 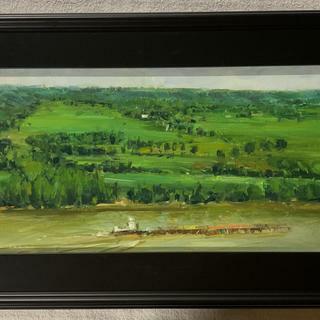 custom sized plein aire frame is just what i need. I love the elegant but refined profile. The thickness of the frame negates the need for a matte board as well. These are very elegant plein air frames, and looks good on all my photographs and canvases! My customer requested it because it complimented the painting she commissioned from me of her Black Doberman. She said it matched her other frames perfectly. I suggested this frame to her because I have ordered this frame before and have been very happy with it. 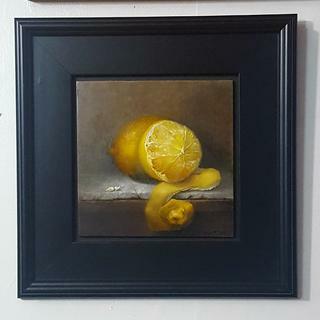 I previously ordered this for two oil portraits and was very pleased. I am presently painting a third portrait and decided to use it as well. No too wide, not too narrow, not too fancy. I love the wide simple black frames that you offer - they really make a painting pop! Was recommended by Customer Service. I appreciated the suggestion. The black frame perfectly showcases the bright colors of the paintings I chose this style frame for. Plein Air are great for galleries, look like tuxedos or little black dresses...dress up the oil. Classic black frame, nice dimensions, sets off a painting without too much detail, but enough detail to lead your eyes to the artwork. Love this frame, second time using it. I like the plein air design. I bought 2 Plein Air Frames and thought they were just awful. For starers on e came without D-rings and screws. What are these things made of? I had a terrible time putting the screw in. I had to drill the holes first then lean my full body weight on the electric driver to get the screws to go in. Plus there is no back on the frame. How does one go about getting backs to finish a custom look? BEST ANSWER: Phyllis, we apologize for any inconvenience. The frames come with free hardware which includes hanging wire, d-rings and retainer clips. If you did not get the hanging materials, we could have sent those to you. If you are not happy with the frame, please give us a call so that you can return the frame. We can be reached at 1-800-332-8884. You can also order backing over the phone with us. Our custom frames are sold as frame only, and you must add on the acrylic and backing. We found that our customers using the frames for canvas were throwing out the acrylic and backing, therefore, these items are to be added on as needed. We are an environmentally friendly company and always look to reduce materials returning to the land-fill. BEST ANSWER: Hello! Thank you for your inquiry! The width of this gorgeous frame is 3". Have a Frametastic day!